It truly has been an era of rediscovery for Treasure developed titles. 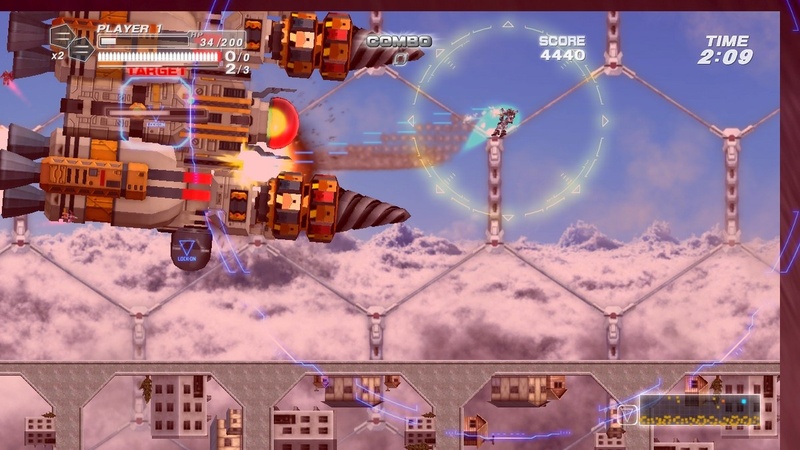 Games like Gunstar Heroes, Ikaruga, and Sin & Punishment have already become downloadable titles, and others such as Radiant Silvergun and the recently announced Guardian Heroes are not too far behind. It’s an excellent time to pick up these awesome games and not have to pay collector prices. Bangai-O was one of those Treasure titles that I was interested in, but didn’t want to pay an exorbitant amount of cash to acquire. It was originally released on the Nintendo 64 in Japan, but didn’t make its way to North America until the Dreamcast version, which is what made it such a cult classic in these parts. They did make a Nintendo DS followup titled Bangai-O Spirits, but like some of the other sequels Treasure has done (Advance Guardian Heroes comes to mind), it failed to capture the essence of what made the original so popular. Now, it’s time for Bangai-O‘s third go round on Microsoft’s popular download service. Is this the dream sequel fans were waiting for, or is it time for Bangai-O to GO? The original Bangai-O actually had a storyline that revolved around two children, Riki and Mami, who command the giant mecha Bangai-O in order to stop some fruit thieves from… I dunno… defruiting the galaxy? Anyways, these characters returned in its Nintendo DS sequel to a limited extent, but in Bangai-O HD they are nowhere to be found. The only thing you see before you begin each stage is the professor giving you advice on how to handle your upcoming challenge. So if you were looking for an anime styled mecha plotline to follow, you won’t find it here. In fact, you won’t find anything in regards to story. There are a few different modes to participate in, but nothing that is any more significant than what was in Bangai-O Spirits. You have access to a tutorial which is thankfully not as lengthy as the one in the DS version. On the other hand, it doesn’t tell you much either, so you’ll still be better off looking at the game’s manual from the pause screen. 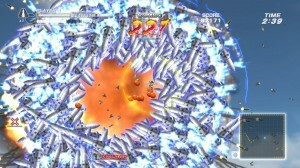 The main single player mode is Fury Mode, which spans 47 stages in length. If you are somehow able to clear all of those, there are approximately an additional 50 bonus stages for you to conquer as well. 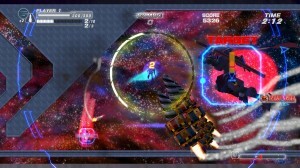 This is rounded off by the ability to create your own stages and play cooperatively with someone. It isn’t a ton of variety, but it sure is a lot to do. While not as pretty as other games found on Xbox Live Arcade, Bangai-O HD has a few things going for it. First and foremost, the sprites used actually look like they belong in an HD environment, as they are not pixelated nor do they have that ugly smoothing effect that Gunstar Heroes does when you have that enabled. That said, there is very little variety in the backgrounds and you end up encountering many of the same enemies stage after stage. And all the sprites are very small, so it’s quite easy to lose track of them amidst all the chaos that takes place. Speaking of chaos, you’ll notice by looking at the achievements list that Bangai-O has the ability to fire up to a million missiles at once. Yeah, you heard me. 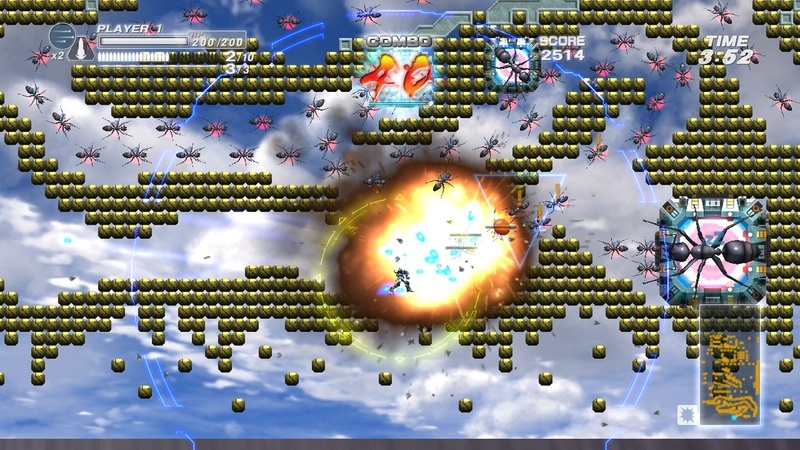 One million missiles that not only cover the entire screen but, combined with all of the enemies and the gunfire fixed on you, brings the game to its knees. Luckily, its not as bad as the DS version where the game jokes that not everything will display due to the system’s limitations. There is a noticeable period of lag when you first perform something like this, but you do see every shot fired. At least, I assume you do. Can’t say I counted every shot I ever fired off. Kudos to you if you can. Bangai-O HD has a pretty good soundtrack that plays in the background, but chances are you won’t be able to hear it most of the time due to all the explosions that take place. Everything from the menu music to the tracks that play on the various stages are very dramatic and incredibly drum based, which gets you in the mood to smash up some robot mechs and giant ants. There’s also a victory theme that plays when you complete a stage successfully that’s quite drawn out, but you’ll find yourself listening to the entire thing every time to celebrate what few victories you’ll manage to obtain (more on that later). There are no voices in Bangai-O HD, just as there is no plot. 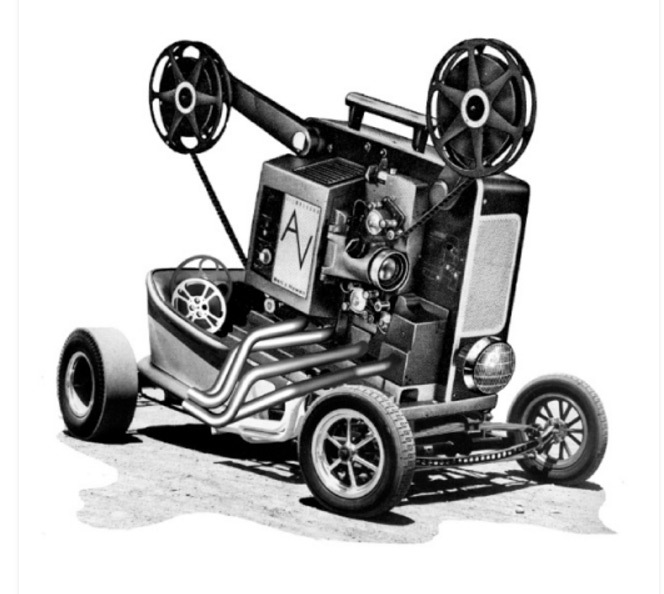 Not even a “Bangai-O GO!”Â before every level. Probably for the better though, when you consider how often you’ll inevitably be playing each stage. 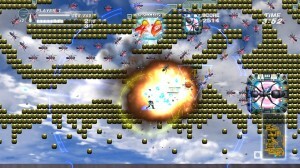 If I could sum up the gameplay in Bangai-O HD in one word, it would be this: chaos. 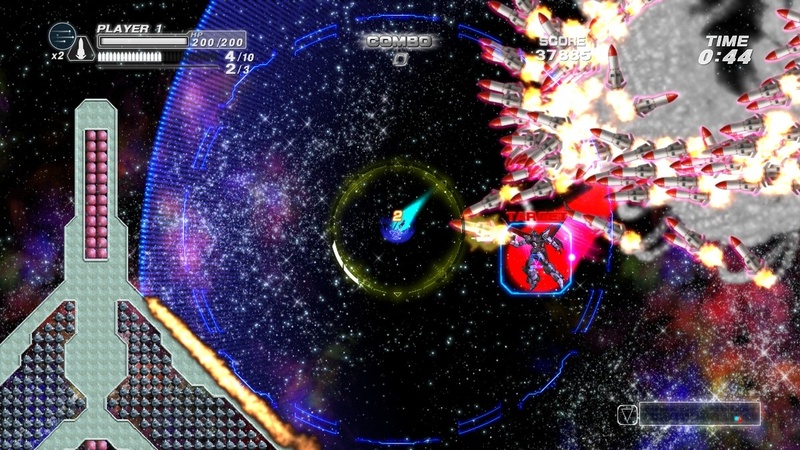 Yes, while it is technically a bullet hell shooter, your approach to each stage can be likened to the way you would handle a puzzle game. You are given two weapons at the beginning of each level (which are chosen for you) as well as a handicap in some cases (like an inability to dash, for example). You’re also timed, so you must destroy all enemies/targets within the target time all while staying alive, and there is generally only one strategy that works for each stage. However, you also have to have the skill to carry out that strategy. At your disposal, as I mentioned earlier, are two different guns which can be alternated with the left bumper. The left thumbstick controls your movement, while the right thumbstick allows you to shoot in whatever direction it is pointed in, much like other twin stick shooters. Pressing the A button allows you to autofire in whatever direction the stick was last pointed in, so if your thumb has another job to do, it doesn’t have to keep holding the stick down. You can also remain stationary with the right bumper if you don’t want gravity to pull you down. In the upper left hand corner of the screen underneath your health bar is your Ex Gauge. Next to this gauge is a number that reflects how many counter attacks you can do. This is the bread and butter of your offensive in most cases. When you hold down the left trigger, you will become invincible momentarily and charge up your attack. There are also a blue and yellow circle that surround you and the more enemies and gunfire that are within range when you unleash your counter attack the more bullets you fire back and the more powerful they are. There’s also a multiplier that you can add by pressing the right trigger while you are charging up your counter attack that goes up to four, though this expels more of your Ex Gauge by doing this. 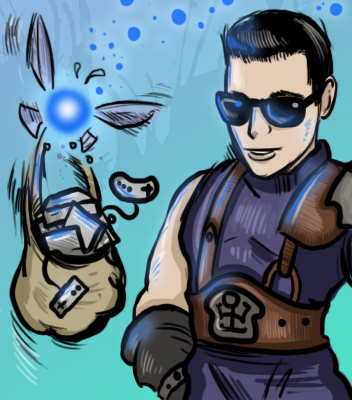 You can recharge your Ex Gauge (and your health for that matter) by collecting fruits dropped by your enemies. So by carefully planning when to unleash your most powerful counter attacks, you may end up maxing out your gauge right away just from the sheer damage you’ve inflicted. If your Ex Gauge is above five, you can also use a Max Attack with X that makes you temporarily invincible and powers up all your attacks. You also have limitless dash capability, but your Ex Gauge will empty out completely when it ends, which could leave you in a vulnerable position. 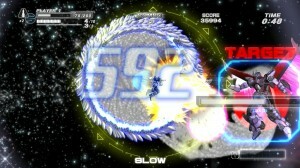 Utilizing your dash attack will be another strategy that gets you far in this game. Using the right trigger allows you to collide with an enemy and deal damage to them, up until your gauge expires. The number of dash gauges you have at your disposal is displayed below your Ex Gauge and will recharge on its own. If you remain stationary while using the right trigger, you’ll unleash a freeze attack instead that renders any nearby enemies motionless and allows you to either escape or resume your attack unhindered. I’m sure this all sounds very complex when reading about it, and I must admit I was originally very overwhelmed the first time I played the game. But with a little practice, it’s very easy to grasp the basics of the game and repeated attempts of each stage help you master them. It’s a lot of fun, and very rewarding for anyone willing to put in the time. Upon first glance, when you see that the game’s hundred or so stages have a time limit of only a couple minutes, you may think that the game just whizzes by. You’d be wrong. I guarantee that many of the stages will take several attempts to complete and others will require a ton of practice before you even grasp the gist of what you are supposed to do. There’s also a mode reserved for creating your own stages. You can start from scratch, or you can modify one of the many included with the game. The interface is incredibly clunky, but if you’re willing to spend the time with it, you can come with some crazy scenarios for yourself or your friends to enjoy. In fact, there’s an upload option so that those on your friends list can take some of your concoctions for a spin. There is a co-op mode in place if you want to play through some stages with a friend, though it only allows for Xbox Live or system link. No split screen mode for couch co-op. 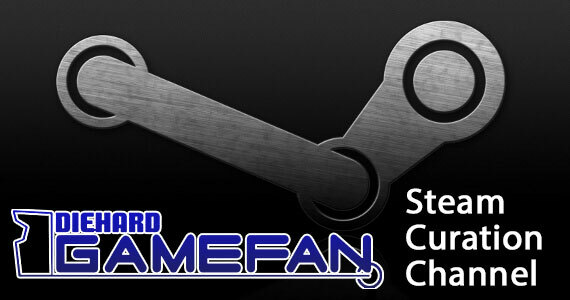 If you don’t have anyone on your friends list that has this game, you can host a game for a random stranger to join, or you can get quick matched with someone automatically. It wasn’t very quick, however. Each attempt took me 5-10 minutes to find someone and once I finally joined their game, it was plagued by copious amounts of lag, even when there was barely anything happening onscreen. Hopefully they can patch something in that fixes this, as I would hate for such an enjoyable feature to go underutilized for being so broken. Let me just come out and say it: this game is hard. So hard in fact, that I haven’t even seen what the bonus stages have in store for me (and a quick look at the leaderboards tells me there aren’t too many in the entire world that have). That said, the game doesn’t completely close itself off to you if you’re not too good at it. It progresses in a linear fashion, but if you get a game over three times in a row, the game will take pity on you and allow you to progress to the next stage. This is a nice feature, as it allows you to tackle stages at your own pace preventing you from getting stuck just because of one stubborn level. If you don’t handle frequent defeat too well though, this is not the game for you. As soon as you begin a stage, if you don’t start doing something immediately, you will die within seconds. Sometimes you will die within seconds anyway just from the sheer amount of crap that gets thrown at you. 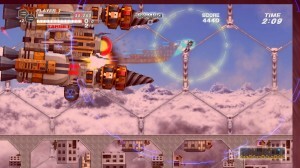 Every stage has a basic strategy that ensures victory though, so the levels are never unfair. It’s just a matter of figuring out what that strategy is. 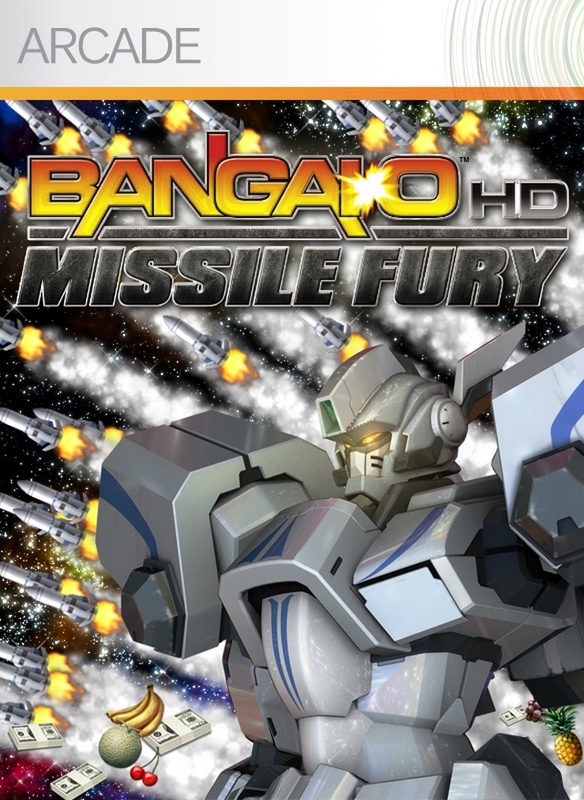 So despite the insane difficulty, Bangai-O HD remains a fun game and if you can find a friend to play with you (preferably via system link so you don’t have the lag), it makes things a tad easier on you. 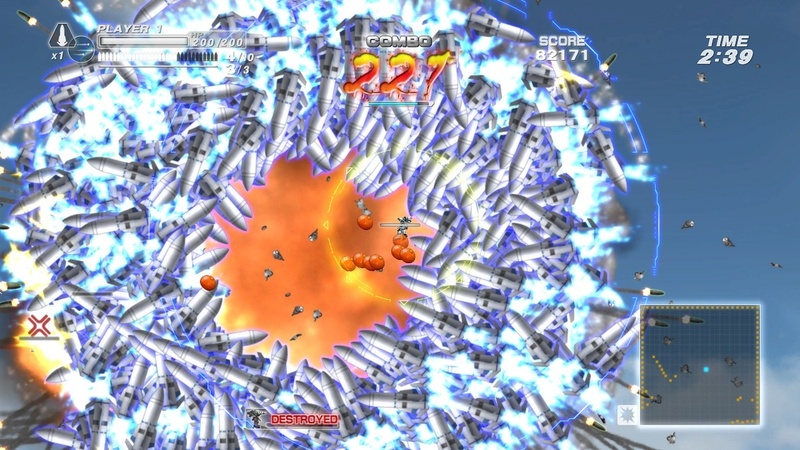 Despite being the third game in the series (fourth if you count the N64), Bangai-O manages to stand apart from the rest of the twin stick shooter/bullet hell crowd by relying just as heavily on strategy and puzzle solving as it does on quick reflexes. It’s not always as simple as just scrolling in one direction and shooting everything that moves or even just clearing out the map. Yes, it takes skill all the same, but it’s knowing what to do with that skill that’s key and I haven’t played anything else quite like it. If you’re looking for a unique alternative to Treasure’s own Ikaruga, than this is it. This is a tough area to score. Bangai-O HD is definitely a tough game to put down, and despite countless defeats you will likely find yourself cruising through trying out each individual stage as they are unlocked. Once they are all open to you, it then becomes a matter of picking one out and dedicating yourself to finding a way to beat it. Sure, you can switch stages at any time if your ego takes too many lashings, but then you lose that “groove”Â that you get yourself into once you’ve attempted the same stage over and over. For some people, hitting a wall only inspires them to try harder. For others, it’s going to break them. However, I do think everyone will be glued to the game at least for awhile. Even if it is just for the first few hours. Tough games are a hard sell for a lot of people, though not in all cases (Demon’s Souls comes to mind). 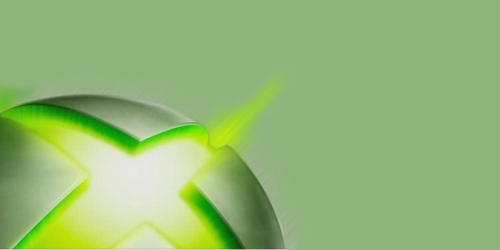 Luckily, all Xbox Live Arcade games come with a trial version, so those that are wary of owning a game where they may accomplish little to nothing can at least get their feet wet before diving in. Games of this genre seem to be pretty popular on the service, so I suspect a fair number of gamers will at least try the game. It’s not going to be for everyone though, and not many have experienced the original Dreamcast release to know what to expect. The DS version, as different as it was, might even drive some users away. Crazy right? Okay, maybe not that crazy. Certainly not as expensive as say Guardian Heroes. But the after market prices on Treasure games generally stay pretty high after they go out of print, so it’s nice that they are finding new life on the various downloadable services out there. Having either the N64 or Dreamcast version as a hidden unlockable would’ve been pretty cool, but it’s hard to complain when you consider all you’re getting for the money. 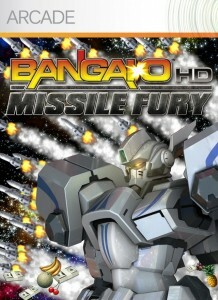 Bangai-O HD: Missile Fury lives up to its name by making it commonplace to unleash thousands, and in some cases, millions of missiles upon your enemies at once. It’s a tough as nails shoot ’em up game containing over a hundred stages as well as the ability to create your own stages and share them with your friends. You can also play co-op both online or via system link, though the former tends to be very laggy. 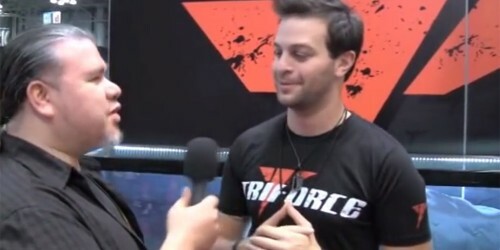 It’s a tough sell for anyone not already familiar with the franchise or Treasure games in general, but those that do take the plunge and are willing to learn the game’s nuances will be rewarded with addictive gameplay that emphasizes both dexterity and strategy.